One of the things that has happened to me in recent months while writing this blog has been finding myself getting involved in the online community in Fort McMurray. When I first joined Twitter, that 140-character way of reaching out to the world, I was hesitant about it. I saw it simply as a tool to spread the word about this blog, but not much more than that. What I never realized was that it had the potential to do so much more, including helping me to find new friends in the community. 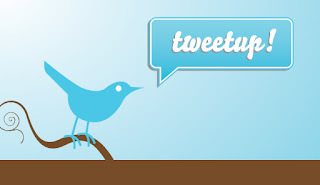 Twitter is an interesting medium, you "tweet" your message and off it goes into the twitterverse. I began tweeting specifically about the blog but as time went on I found myself interacting in personal discussions with people on Twitter. And then I attended my first "tweetup", and learned that I had made some of those twitterverse friends into real-life friends, too. A "tweetup", for those curious, is nothing more than a gathering of people who met initially on Twitter. It's not a group of people who sit around a table and tweet to each other on their cell phones, and it's not weird. It's actually pretty awesome, and you never know who will show up. Someone (anyone, really) decides on a place, date, and time, starts to tweet that information, and then you just show up and see who else does, too. Last night we met at McRay's in Thickwood, and for some it was just one of many tweetups, while for others it was their very first (but I bet not their last, either). I showed up right at the tweetup start time (this time tends to be flexible, especially if the tweetup is happening in a bar, which is where the tweetup moved after supper last night). I was in fact the first to arrive, but I only had an hour as after the tweetup I had to head to Keyano Theatre to see a percussion group from Toronto that is touring the prairie provinces. When asked about my plans post-tweetup I informed my fellow "tweeps" (a combination of tweets and peeps) that I was heading out to get "TorQ'd", which provoked a few laughs and entertaining comments. 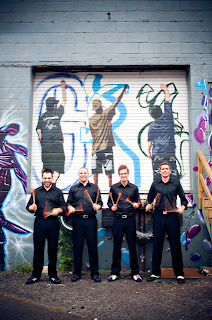 It was quite accurate, though, as the name of the percussion group is, in fact, "TorQ". When my hour was over I was sad to leave - many of my favourite Fort McMurray folks were at the tweetup, people I've become very fond of, and leaving was hard - but I was excited about TorQ, and I was not disappointed. I arrived at Keyano and met my friend, a wonderful woman who kindly invited me to attend the concert. She has been a most gracious host to me on several occasions, and this was yet another. I was quite grateful as I must admit I'm not always completely on the ball with getting tickets to things like this, so having someone in my life who says "I have two tickets, you coming?" is truly special. She and I headed into the theatre, took our seats, and awaited the show (while laughing, and discussing shoes and politics). TorQ is a bit tough to describe, as an all-percussion ensemble must be heard, I think, to be truly understood. One of the first things I noticed when they took the stage, four young men, is that they all wore something red. There were red shoes, and red ties, and red shoelaces, and red glasses, and a red shirt. The other colours they wore were fairly sombre, browns and greys, but each one had something red on them, and it matched the red lighting that lit up the curtains behind them. I found this immediately intriguing. Red is one of those colours you instantly associate with certain words and feelings - things like hot, and fiery, and spicy. I knew at that moment that this was going to be very, very interesting. I also knew that I in particular would find this experience meaningful, as I am not particularly good at rhythms. When an audience is clapping along I am the one who is slightly off, and sometimes off enough to make people stare. So, to see an ensemble based entirely on percussion was not only novel for me, but intriguing, too. TorQ utilizes a variety of percussion instruments from the very large to the very small. They began the show with a number in which they each used a small instrument, and throughout the show it would build from small to large, and back to small again. I found several pieces that were my favourite, including "Sleep", a lovely, shimmery, ethereal piece that somehow reminded me of Enya, that Irish musician who records music that sort of flows over your soul. They played a few pieces they themselves had composed, explaining that it can be difficult to find pieces that have been written with percussion-only ensembles in mind, and how if they do not write them then they are forced to adapt other pieces or search out those rare pieces designed for them. The pieces all differ in intensity and I suppose all I can say is that they are mesmerizing - walls of sound that wash over you, and down into you as only a percussion instrument can. One particularly fun piece involved two members of the audience, and is titled "Natural Resources (what to do until the power comes on)". It is about "found sounds", involving a table, two mallets, two musicians, and a variety of percussion instruments that are chosen at random, placed on the table, and an experiment in sound begins. It is, of course, fascinating as each time it would be different dependent on which instruments are placed on the table. It's percussion improv, and I was delighted with it. The gentlemen from TorQ spoke a bit about how acoustic sounds slowly became electronic ones, and how now electronic music influences acoustic music. I found this fascinating, too, as I have long been a fan of electronica, and the way electronically-produced music can have layers and layers of sound, rather like a many-layered trifle, with each layer holding a new delight. And this is what I found with what TorQ does, too, the intricate layering of sound blending into a transfixing piece. I noticed the rest of the audience, a fairly decent sized crowd, also seemed mesmerized. It's hard not to be when you see four young men doing something amazing, appearing to love every second, and creating something spectacular along the way. Another piece that amazed was one written by John Cage, the admittedly quirky musician and composer. Called "Third Construction", it was the sort of thing where you didn't know what to watch as all four musicians had their hands full with various instruments, and those were hands flying. While watching this piece I realized that you probably don't see a lot of overweight percussionists, as these men were constantly in motion, and at the end of the pieces looked like they'd had a rather good workout. I suspect percussion is not only good for the soul but perhaps for cardio workouts, too. The show, which had begun with each musician and a simple handheld (or in one case, sat-on box) instrument, ended with garbage cans and mallets. With several garbage cans, some mallets, and a show of energy that defied any notion that they might be tired from the preceding numbers, TorQ finished strong. Their skill, synchronization, and sense of fun was astonishing to witness - and for someone like me, who would describe herself as "rhythm challenged", nothing short of miraculous. After the show I reflected a bit on those red ties and shoelaces and glasses, and came to this conclusion - TorQ is hot. Those young men are hot in every sense of the word, from the intellectual looking one with the collared shirt and sweater to the one with the GQ-worthy vest to the one with the slightly nerdy red glasses to the one with the shaved head and slightly "bad boy" look. The little bit of red they each wore betrayed that they are fiery, and spicy, and hot, and incredibly musically talented. They are a complete joy to watch and to hear, and I intend to purchase some of their pieces on iTunes today. After I said goodbye to my friend and left Keyano I actually headed back to the tweetup for a few minutes to check on my other friends, and found them comfortably ensconced at the Black Horse Pub, enjoying a few drinks and each other's company. I sat with them for a few minutes, and quickly found myself getting involved in a discussion on local politics, my opinions, and the desire to see what is best for the community. I looked around the tables of Fort Mac people, and while some of us might have met on Twitter I saw only friends. So, in the end, it was a night of tweetups, round one and two, and of getting TorQ'd in the best possible way. And that, people, was my Saturday in Fort Mac. Friends and politics and music and drinks. It was, quite frankly, my favourite kind of night out in this community, blending together all the things I love - people, and events, and places, and ideas, and thoughts. It was just another Fort Mac Saturday night of tweetups and TorQ.